Joanne Flynn & Haley Hancock are the owners of H&F Designs Ltd., a retail company specializing in design and print services. This eye popping print shop is located in Forteau, a community on the southern shore of Labrador. After starting only a little over a year ago, the print shop already employs one other person and is looking for another employee in the near future. To get started Joanne & Haley first contacted their local BTCRD representative Jamie Pye, who put them in contact with Nunacor and from there CBDC. During this process they were able to start their business plan and secure funding from the CBDC’s First Time Entrepreneur loan. 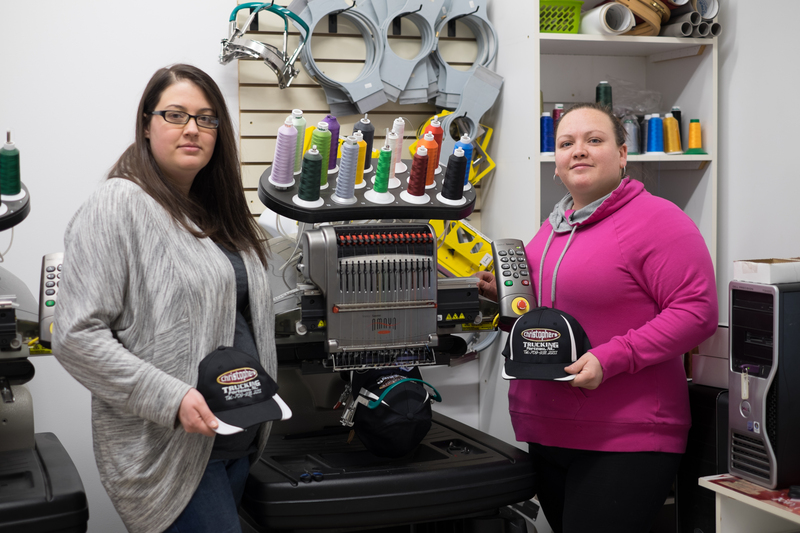 When asked what their goal for their business was the girls said “It’s simple really, we want to become the best at what we do.” We are grateful for the knowledge the CBDC passed on to us to help us succeed in the business world. We love being small business owners; we have the independence of working for ourselves which is very fulfilling personally and enjoy the flexible hours. Our advice for anyone wanting to work for themselves is to make sure you are dedicated and committed to working the tough hours to get your business growing. It’s not easy at the beginning but if you’re willing to work for it, you can make it.